The latest bone-chilling installment of From Dusk Till Dawn reveals how this frightening saga all began! Narrowly escaping death, outlaw Johnny Madrid (Marco Leonardi - Like Water For Chocolate) is on the run from the hangman (Temuera Morrison - Six Days, Seven Nights)…with the hangman's sensuous daughter Esmeralda by his side! Along with Madrid's gang, Johnny and Esmeralda embark on an adventure filled with colorful and unsavory characters who lead them straight into the fight of their lives! Also featuring Danny Trejo (Con Air), Rebecca Gayheart (Scream 2), and Michael Parks (From Dusk Till Dawn 1 & 2) - you won't want to miss a minute of the epic confrontation that results in Esmeralda's discovery of her secret birthright! DVD: Widescreen 1.85:1/16x9; audio English DD 5.1; subtitles none; closed-captioned; single sided - single layered; 15 chapters; rated R; 94 min. ; $29.99; street date 1/18/00. Perhaps someday I'll understand why unsuccessful films beget sequels, but it won't happen today. Actually, I suppose I do have some comprehension of this phenomenon. With cable and video and all sorts of outlets for movies other than the local multiplex, I guess it becomes cost-effective to create these kinds of films. After all, there's some form of name-identification, and since the sequels likely cost little money, the producers may feel they have nothing to lose. While the financial equation may make sense, it still feels wrong to me. 1996's From Dusk Till Dawn wasn't exactly a blockbuster - actually, with a US gross of only about $25 million, it pretty much tanked at the box office - but I suppose it reached a core audience that would be hungry for more. After a three-year wait, they finally got a second helping through 1999's direct-to-video (DTV) offering, From Dusk Til Dawn 2: Texas Blood Money. That movie was an unmitigated disaster; I didn't think the original was anything special, but it's a masterpiece compared to the misery that is FDTD 2. Despite that fact, the studio soldiered on and decided to make From Dusk Til Dawn 3: The Hangman's Daughter. Another DTV release, it appeared in 2000. While it's not much of a movie, I thought FDTD 3 was reasonably entertaining, especially in comparison with its immediate predecessor. Actually, FDTD 3 is a prequel to the other two films. As with the first movie, it keeps the true nature of the story a bit of a secret until the second half. We're introduced to a set of standard Western characters: a Mexican outlaw, the woman he attracts, an older man on a mission, a young gunslinger wannabe, and a Bible-thumping couple of newlyweds. The plot progresses through a variety of situations typical of the Western genre - hangings, gunfights, stagecoach heists - before the characters reach a bar where thinks change. If you know absolutely nothing about the series, it may come as a surprise that vampires appear in the film's second half, but otherwise, it's expected, and - as with the first two movies - it all happens at this bar. Really, FDTD 3 is little more than a rehash of the original picture with the difference stemming from its period; it takes place in the 19th century. Other than that, the two movies are pretty similar, though FDTD 3 isn't nearly as good as the original. Nonetheless, it has some moments. Unlike the supremely predictable FDTD 2, I thought this one provided a few nice twists and turns to its plot; the vampire element obviously wasn't a surprise, but a couple of other aspects did catch me off guard, and those made the entire film more enjoyable for me. FDTD 3 also doesn't try to reinvent the wheel. The presentation sticks closely to the standards of the Western genre, and - unlike the absurdly-stylized FDTD 2 - it utilizes fairly straightforward methods of filmmaking. This isn't to say the movie lacks any sense of creativity or flair, as it seems nicely-rendered, and a few scenes - particularly a dreamy dance-sequence that uses sepia-tone - were actually somewhat memorable. However, director P.J. Pesce keeps things in check so that the movie doesn't feel like a desperate attempt to impress us with visual panache. In the end, From Dusk Til Dawn 3: The Hangman's Daughter really isn't much of a movie. It's just the same rehashed nonsense seen in the first couple of films. Nonetheless, I thought it was vastly superior to FDTD 2 and it provided me with some moments of enjoyment. Fans of the first movie may want to give it a look. 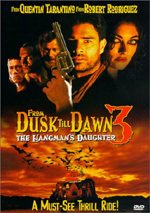 From Dusk Til Dawn 3: The Hangman's Daughter appears in an aspect ratio of approximately 1.85:1 on this single-sided, single-layered DVD; the image has been enhanced for 16X9 televisions. Although it's not without flaws, the picture generally seemed very solid and the movie looked quite good. Sharpness appeared absolutely rock-solid throughout the film. The image always seemed crisp and detailed, and I detected no concerns related to haziness or softness; it's a tight little picture. Moiré effects and jagged edges seemed to pose no problems, and I saw only mild artifacts from the anamorphic downconversion on my 4X3 TV. The print betrayed some light speckling, a little grain, and a couple of streaks, but overall it seemed clean and fresh; no major defects presented themselves. FDTD 3 uses a very restricted palette. The color scheme orients toward a dry, arid Western landscape look that doesn't lend itself toward bright and vivid hues. That said, I found the colors displayed to appear accurate and solid; I saw no concerns related to these tones, which were largely pleasing. Note that not only does the movie feature a limited palette, but one entire sequence goes to sepia-tone; there's a dance scene in which the film shifts to this monochrome appearance. It actually works quite well, and the DVD presented the scene vividly. Black levels appeared nicely deep and rich throughout the film, and contrast usually seemed strong. Shadow detail could be a minor concern during some interiors. At those times, I thought the image could look slightly thicker and more opaque than it should. Nonetheless, the picture of FDTD 3 was generally very solid and it displayed no significant problems. Also strong is the film's Dolby Digital 5.1 soundtrack. The movie offered audio that spread fairly effectively to the side channels, though the track didn't seem terribly ambitious. The front speakers got the most activity, as they boasted decent breadth and depth to the stereo imaging. Music and a variety of effects appeared in those channels, and the audio integrated nicely. The surrounds also got a fair amount of work, though I felt they were not nearly as involving as they could have been. Although some mild split-surround usage occurred - most notably during a gunfight sequence fairly early in the film - for the most part the rears appeared to offer monaural sound. They bolstered the forward mix to a decent degree but were not the active partners I'd expect from a modern film of this genre. Audio quality seemed quite strong overall. Dialogue displayed some mild edginess at times but usually appeared distinct and natural, and I witnessed no concerns related to intelligibility. Music was bright and clear and showed nice range, while effects were crisp and hyper-realistic; they lacked noticeable distortion and seemed to portray the events with depth. The mix boasted some pretty solid bass at times and generally bolstered the effect of the film. The track's lack of ambition knocked down my grade somewhat, but FDTD 3 still earned a solid "B+". Less exciting are the DVD's supplements - or supplement, actually, since there's only one. We find one deleted scene that lasts a whopping 50 seconds. Well, at least it's an interesting clip; I won't divulge its surprise, but it would have added an interesting capper to the film. Note: From Dusk Til Dawn 3: The Hangman's Daughter is available on its own or as part of a package that contains all three of the FDTD films. Are there any advantages to the purchase of this box? Not many. You save only a little money; the box lists for $89.99, and the titles separately would cost $92.97 (the first movie is $32.99, while the two sequels run $29.99 each). With that package, the DVDs also come in a nice slipcase and we get a very good booklet. Otherwise the boxed set possesses no advantages over the individual DVDs; the content on each is identical.